Brief Description Bike ride around Bleckley County. 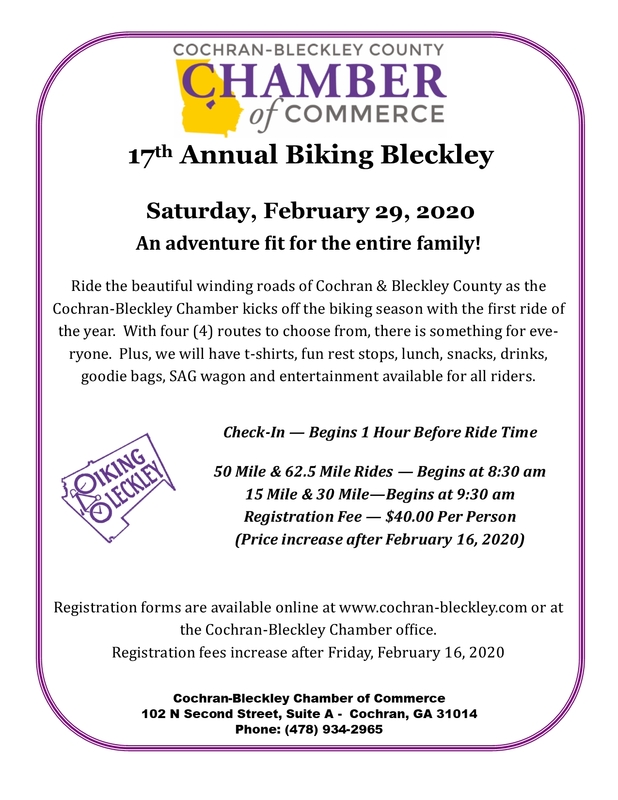 Description Ride the beautiful winding roads of Cochran & Bleckley County as the Cochran-Bleckley Chamber kicks off the biking season with the first ride of the year. With five (5) routes to choose from, there is something for everyone. Plus, we will have t-shirts, fun rest stops, lunch, snacks, drinks, goodie bags, SAG wagon and entertainment available for all riders. Registration forms are available online at https://endurancecui.active.com/event-reg/select-race?e=52421451 or at the Cochran-Bleckley Chamber office. Registration fees increase after Friday, February 8, 2019. Biking Bleckley to your free online travel itinerary.